A copper scroll was unearthed in a cave at the Dead Sea in 1952. Astonishingly, it described sixty four sites where enormous amounts of gold and silver treasures were supposed to be buried in biblical times. The scroll also outlined the existence of a duplicate inventory, which indicated the treasures item by item. Many archaeological expeditions were organised to find the buried treasure and the duplicate inventory but they all ended in failure. In a dramatic new development, it has now been discovered that most of the sixty four sites were listed in the Bible. This was an amazing breakthrough especially as all the biblical experts had failed to recognise that the Old Testament was the duplicate inventory. There was a litany of numbers listed on the scroll and these mainly indicated the weights of each treasure. For example: 600 Talents or 20,520 Kilograms. Those numbers have proven to be the real gems. They readily formed into modular structures whose totals were the indices of a mystifying calendar system for projecting time onto eternity. Sensationally, the modules were laid out on the copper scroll in a structure that is the actual emblem of Christianity – the sign of a cross +. What a discovery? 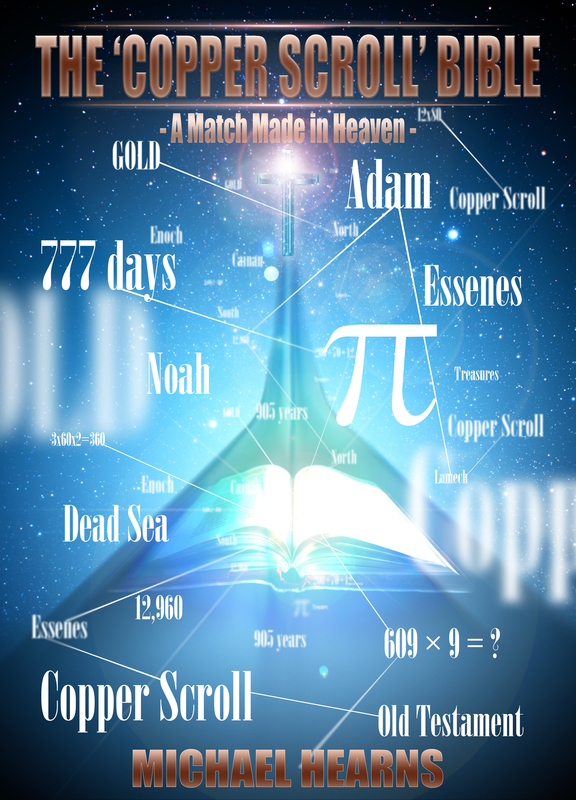 The facts and figures of these astonishing findings in The “Copper Scroll” Bible are here at your fingertips. A paperback version of the book is available on Amazon. During an examination of the numbers on the copper scroll I added up the numbers between the Greek letters. To my amazement the total of the numbers between the Greek letters of HN and ΣK came to 969, which was the final age of Methuselah. It was not just coincidence because the total of the numbers between the Greek letters of ΔI and ΣK added up to 777, which was the final age of Methuselah’s son Lamech. The flood gates had opened and one by one, the final ages of all of Adam’s generations as listed in Chapter 5 of the Book of Genesis were detected and these formed into modules as shown in the green rectangular modules on the Illustration below. This was followed where the ages of Noah’s descendants were detected. The most important modules of all that were formed were with particular time period in either years or days for they were the indices of a unique biblical calendar, which I had been researching for several years. This peculiar calendar measured out time in intervals of 777 days. When I assembled the main periods of the unique calendar together it was sensational because the modules formed into a structure that is the emblem of Christianity – the shape of a cross. The cross is displayed below and its main structure was formed from 15 modules of 777 days each. 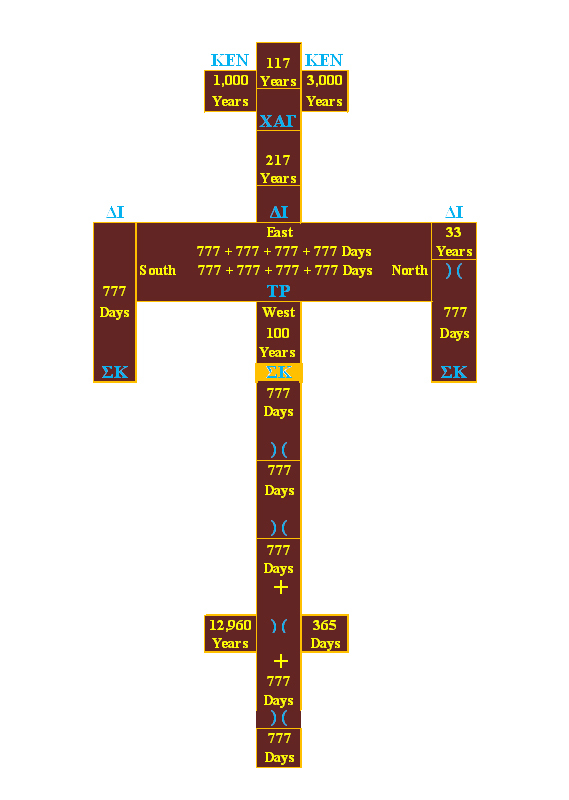 The 777 days was the yardstick to project out time into the future in those time periods in years, which are displayed in the other modules of the cross. The “Copper Scroll” Bible opens up a door into the mysterious secret wisdom of the biblical prophets and shows how they used this sacred calendar to master the invincible force of time.